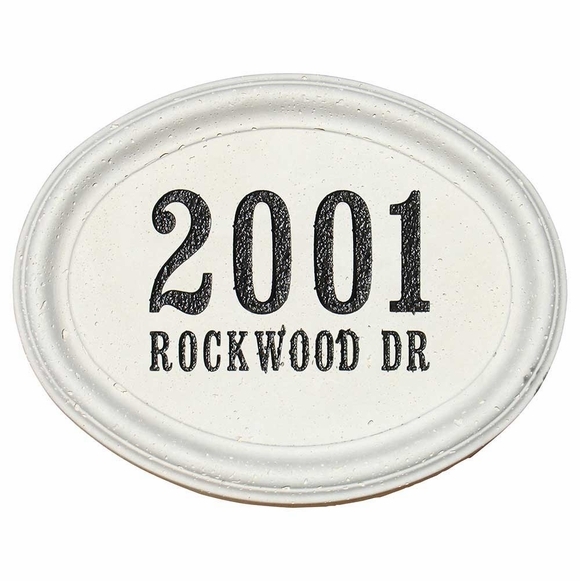 2 Line Concrete Address Block - - personalized oval sign ready for installation into a brick, stone, or concrete wall. Extremely durable self-framed cast concrete block serves as a unique surface for the deeply etched numbers and letters. Available with two lines of the wording you supply etched into the surface. Line 1 holds up to four (4) large characters, typically the house number. Line 2 holds up to eleven (11) smaller characters, typically the street name. Three block colors: cream, antique gray, burnt tuscan. Two block finishes: smooth standard surface or rugged, textured travertine surface. Dimensions: 17.5"W x 13.5"H x 2.5"D; weighs 26 pounds. The concrete block is generally placed into the wall. Optional surface-mount studs are sold separately. See top link in Related Products.